It’s not even real summer yet and our kitchen is already too hot to cook in. Thank goodness for the grill! 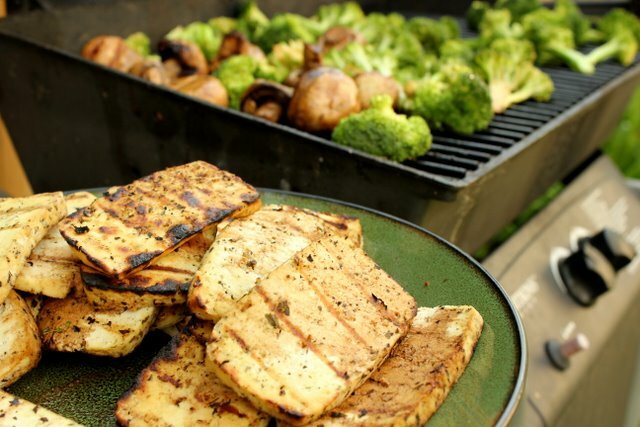 Grilled broccoli? Oh yeah. It was surprisingly good! I really don’t like raw broccoli so I was a little worried that it would be too…raw, but it was just the right amount of crunch. Twin Oaks herbed tofu is so tasty is doesn’t really need much of a marinade, just a little drizzle of olive oil, salt, pepper, and a splash of balsamic. Nope, we didn’t have dinner guests, all that was for the two of us-dinner last night and lunch at the clinic today. Speaking of the clinic, a few weeks ago I replaced my desk chair with an exercise ball and it is AWESOME. I used to get really tense in my shoulders on a regular basis, so tense that I would get killer headaches. Not one bit of achy shoulders since I switched to the ball. My core feels and LOOKS stronger. I sit up straighter. My upper back is stronger from sitting up straight without support. I stand up more because I’m not glued to a desk chair; moving around more keeps me energized and my metabolism humming. If you sit at a desk for a long period of time I highly recommend giving the ball a try. You will want to start slow, an hour or so at a time, and you may feel some fatigue in your upper back for the first few days. Bonus: I now keep my Pilates on the Ball dvd in my desk drawer and squeeze in 10 minute workouts between patients! OMG! Exercise ball for chair! Best idea, ever, Faith! Great idea! Do you feel like you are too low to the ground? My ball is getting a little soft so I am riding low at the moment! Overall it’s been fine. Sitting a little lower means that my head is inline with my laptop (MUCH better for the neck). I do feel a little low when I am talking to patients sitting in the reception area, I feel like a little kid who needs a phone book! Ergonomically it seems to be alright though. 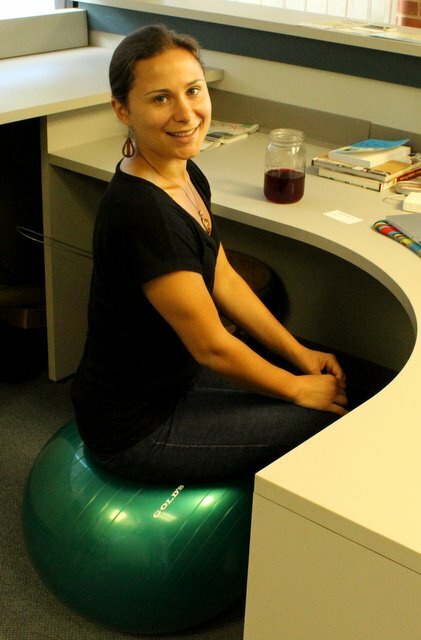 I use a yoga ball at my desk too! I’ve been meaning to mention it — I’m so glad you shared! It’s such a great way to keep your core engaged & maintain body awareness/posture at work. 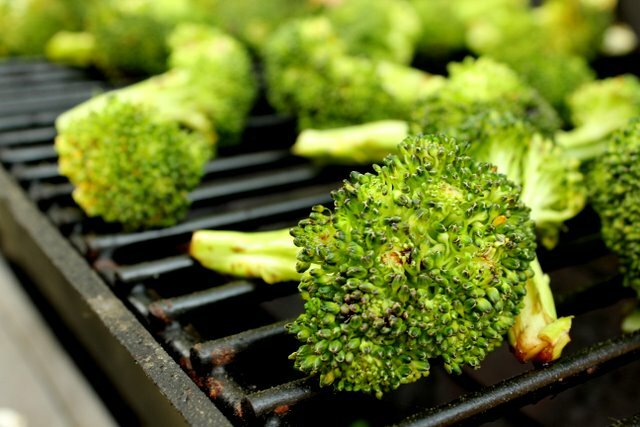 Grilled broccoli — yum! 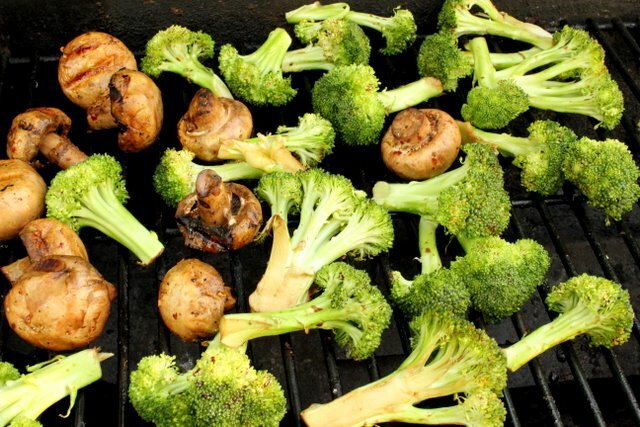 I must try that, because I am not a fan of raw broccoli either but love it roasted. Huh, I would totally have pegged you as a broccoli lover. 🙂 I’ve never tried it grilled, but I totally will now! I work in a hospital and we can’t use the balls at our desks. So sad cuz I’d like to try it. Also wanted to let you know that one of my nursing students is going to bring me a dozen eggs straight from the chickens on her family’s farm. Can hardly wait til Monday. Those are going to be some good eggs! Enjoy them! I would love a stability ball for my desk, but I’m a teacher and I think the kiddos would go nuts 😉 But definitely for my desk at home! Yeah, it would be madness to try to keep them off the ball! I have been thinking about bringing my ball to work to improve my posture and abs. Glad to hear it has helped you so far. My co-worker uses one and she loves it. Yeah, I’ve eyed these for years. For now I am pretty happy with the ball but if I sat at my desk 5 days a week I would probably invest in the chair. Thanks for the link and reminder! I’m with you on the raw broccoli issue, Faith. I thought I was the only one. Haven’t tried grilling it though. Sounds like a good option! My job won’t let me use the ball b/c of liability – ugh. 8 hours a day in an office job is not my ideal type of career. I do have one at home though! I am a third grade teacher and use a stability ball a few hours a day when I am teaching. I do get up and down a lot throughout the day but for computer work after school it is absolutely wonderful! I also let my students use it–as a reward for on task behavior! They ALL want to use the ball. Lots of lessons on how to use it (and lose it if they abuse it) and how they can earn it. It can totally work for kids if you control the use! And with kids these days getting heavier and less active….parents love the idea, too! Plus they really need to wiggle, so it’s a perfect attention tool. That’s great! When my husband was in chiropractic school all the lecture rooms had stability balls as an option in addition to regular chairs.